When I go to the Toronto International Film Festival, I’m looking for films that aren’t big enough to have a release date in American theaters this year. Occasionally, though, I have a time slot in Toronto where nothing else seems to fit, so I go to one of the big buzz-worthy films sure to be released during awards season. Often, these big-budget prestige pictures are very good. Maybe a list like this isn’t as interesting, and certainly not as unique, as the list of overlooked gems, but yeah, I saw these films too, and I generally liked them. A favorite at Telluride and the People’s Choice winner at Toronto is The Imitation Game, starring Benedict Cumberbatch as Alan Turing. Cumberbatch is really good as the gay and socially awkward father of modern computing. The Imitation Game doesn’t make a big deal about Turing’s sexuality, but since the laws against homosexuality in Great Britain are what drove Turing to suicide, it’s an integral part of the story. During the war, Turing pushes his way into a job at Bletchley Park where the Brits are working on cracking the Enigma machine captured from Nazis. In the movie, Turing uses the assignment as an excuse to pursue his pet project, a machine that can solve any problem, not just the Enigma cryptography. Keira Knightley plays Joan Clarke, the smartest of his assistants trying to negotiate gender stereotypes in WWII Britain during her spare moments at Bletchley. 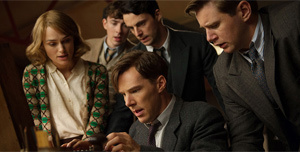 Turing’s persecution after the war forms the film’s second plot line and is intercut with the main story. I hate predictions and I don’t care much about awards, but The Imitation Game has all the makings of a big, popular, award-winning film. It’s a period piece; it’s got charismatic young actors; it has British class; it has Nazi villains; and it’s well edited with a complex storyline that makes you feel smart for keeping pace. Surely it will do well come Oscar time. Ramin Bahrani made it onto my radar in 2007 with Chop Shop, a gritty, well observed character study set among gray-market auto repair shops in New York City. Most recently you might have seen Bahrani in Life Itself, the documentary on Roger Ebert who took a personal and professional shine to Bahrani. In one scene in Life Itself, Bahrani shows off a gift from Ebert that came by way of Laura Dern (well represented at Toronto this year) and Marilyn Monroe. In fact, Laura Dern plays the mother of the main character in99 Homes, a Florida man named Nash. A long and harrowing first scene sees Nash (Andrew Garfield, the latest Spider-Man) and his family evicted from their home. 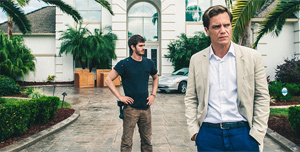 The next twist has him falling into work for the man who evicted him (Michael Shannon, delivering the goods). Later, Nash rises in the ranks of the ruthless realtor’s organization. Redemption follows and the film ends before it can get too messy or implausible. Michael Shannon steals the show with his blue LED e-cigarette. He first comes across as movie-villain evil, but we stick with him long enough to realize he’s just hard, not bad. One of the biggest surprises to me was how passé a story about eviction and foreclosure seem — not that I don’t sympathize, but it seems like a lot has happened in the world since the real-estate crash. The other big surprise was how formulaic 99 Homes seemed, considering the gritty character-first films that made Bahrani an indie auteur to watch. Laura Dern also plays the mother of the main character in Wild. Reese Witherspoon’s character is in high school during the scenes with Dern, and yes, that feels weird to me (Dern was only 9 years old when Witherspoon was born). 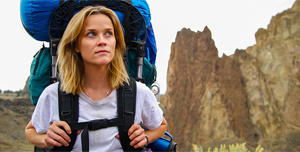 Based on a successful memoir by Cheryl Strayed, Wild stars Reese Witherspoon hiking the Pacific Crest Trail as she puts her life back together. Scenes from the hike lead to flashbacks of her life coming apart, from addiction, failed relationships, and yes, the loss of her mother. Director Jean-Marc Vallée made a big impression in Boulder with C.R.A.Z.Y., then made international waves with The Young Victoria and Dallas Buyers Club. As someone who’s had a life-altering hiking epiphany (albeit smaller than Cheryl’s), I was worried that Vallée would give too much credence to mysticism, and not enough to mere stubbornness and physical habit. Luckily, he gets it right, and he keeps the pace brisk as we jump back and forth from the PCT to the messy life that sent Cheryl hiking in the first place. Witherspoon also appears in The Good Lie, a cheerful and conventional tale about the Lost Boys of Sudan. Don’t get me wrong — I’m not saying the life of a refugee is anything to be cheerful about — only that The Good Lie is not a grim, depressing tale of incomprehensible loss. Instead, Canadian director Philippe Falardeau follows up his award-winning Monsieur Lazar with this conventional story about three brothers and a sister. The first third of the film sees the youngsters escaping the military in Sudan, only to stop at a refugee camp. When they finally get invited to America, they learn that they will be separated, with the brothers going to Kansas City and the sister going to Boston. Then the film becomes a fish-out-of-water story as the boys try to understand American culture. Witherspoon becomes the brothers’ reluctant helper when the overloaded social services would have failed to get them the direct or personal help they would have needed. The Good Lie goes down easy, and it has a facile appeal. It may even prove to be popular, though it isn’t as challenging or interesting as Monsieur Lazhar.